We know you enjoy your standard of living and you shouldn’t have to compromise this when travelling. Choosing a serviced suite over a traditional hotel delivers you more space and more facilities, so make our home your home, when you next stay in Sydney, Brisbane or the Gold Coast. 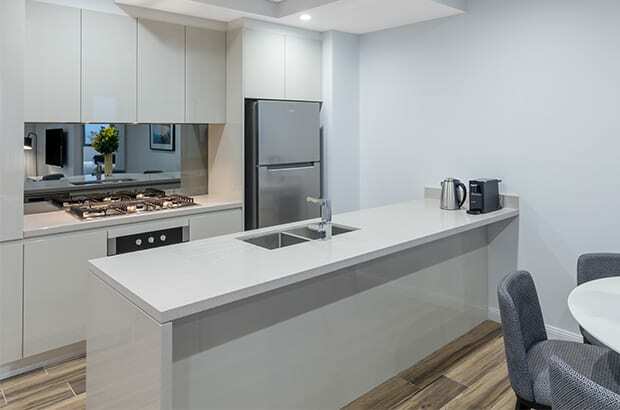 Each Meriton Suites’ building is both landmark and prominent. 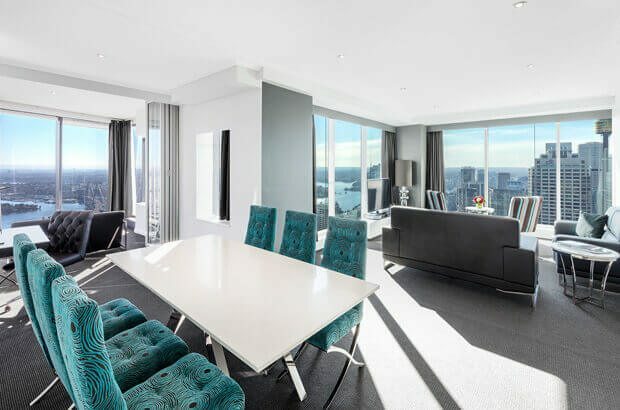 They are among the tallest in the world with many of the suites within Sydney having stunning views across the city’s iconic Harbour and the impressive city skyline. 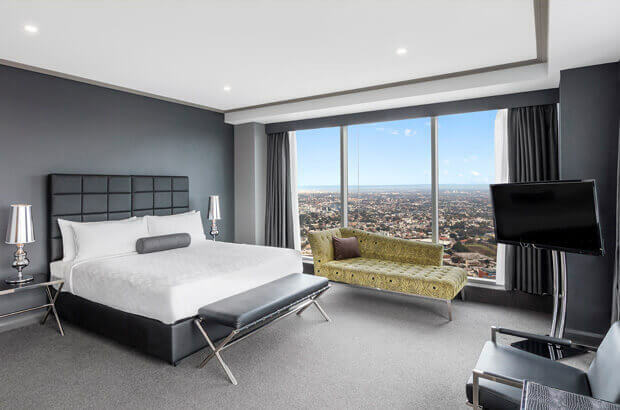 In Brisbane, we have the two tallest buildings offering unrivalled views of Brisbane’s picturesque city while our suites on the Gold Coast feature stunning views of the beautiful coastline and pristine waterways. Enjoy more space than a typical hotel room with your very own lounge and dining area. Unlike traditional hotels, we offer a separate bedroom, lounge and dining space for you to enjoy with family, friends or that special someone. We offer studio, 1 bedroom, 2 bedroom and 3 bedroom suites across our portfolio of hotels, compared with other hotels who only have small studio rooms. For our hotels that offer both studio and 1 bedroom suite types, we suggest you book a 1 bedroom suite as a little extra cost gives you greater value with a separate bedroom, living and dining space. Our hotel suites include a residential sized, spacious gourmet kitchen – perfect to cook your favourite meals whilst you’re travelling. Each of our kitchens have been architecturally designed and include European-style appliances including a ducted range-hood, cooktop, oven, integrated microwave, dishwasher and a full-sized refrigerator. You will find all the essential cooking items and utensils to make use of the residential-style kitchen, including a complete set of glassware, crockery and cookware. All suites at an absolute minimum have a flat screen TV in the Master Bedroom and Living area, with majority of suites across the portfolio now have TVs in all Bedrooms. Foxtel is available at all locations and includes sports, news and documentaries, entertainment, kids and movie channels. 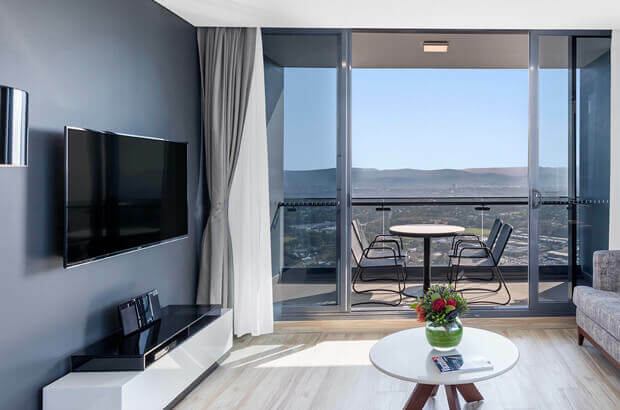 Penthouse Suites have Foxtel IQ with additional premium channels and larger 60″ HD TVs in the Living Area. 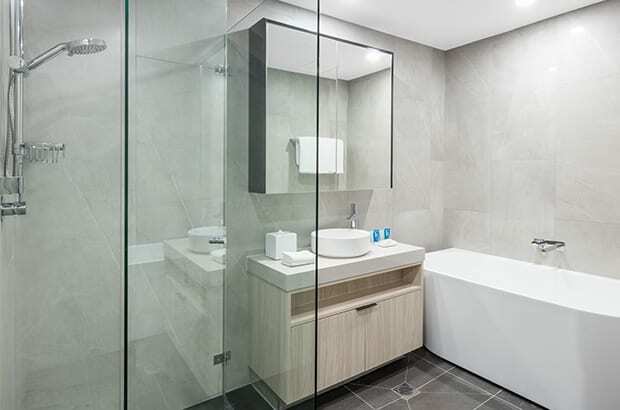 Our bathrooms boast open spaces and clever designs to suit the style and size of each suite. All two and three bedroom suites have two full sized bathrooms and often an additional powder room. All bathrooms are stocked with a selection of guest amenities from our exclusive KEVIN.MURPHY skin care range including soap, shampoo, conditioner, body wash and body lotion. Designed for living, not just sleeping, all our bedrooms feature an electronic guest safe, bedside reading lamps, a clock radio and luggage rack. All bedrooms also feature king sized zipper beds that allow the bedding to be converted into two king single beds, plus each bedroom has a built in wardrobe (some master suites contain a walk in wardrobe). You’ll feel right at home with our floor to ceiling wardrobes allowing you to stow your items and hang your garments. All of our suites have a full-sized internal laundry, including a top loading washing machine, tumble dryer, iron, ironing board, plus ample storage with a large sink and washing detergent. 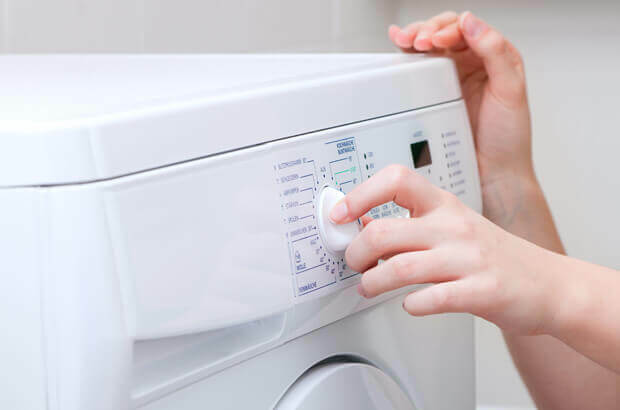 Allowing for fast, low cost and hassle-free washing options to suit all of our guests. Our suites also have a local preferred ‘same-day’ dry cleaning specialist if you prefer your items to be sent out. Whether you enjoy a chat or just want to find the best coffee shop in town, our warm welcoming, award-winning hotel staff are more than happy help. It’s just one of the reason guests continue to return time and time again. For your convenience we have porters onsite to assist with your luggage and directions for local restaurants, cafes and attractions. We also supply ample storage in our onsite luggage rooms for all your belongings so you can continue to enjoy our hotel surrounds well after you check-out. 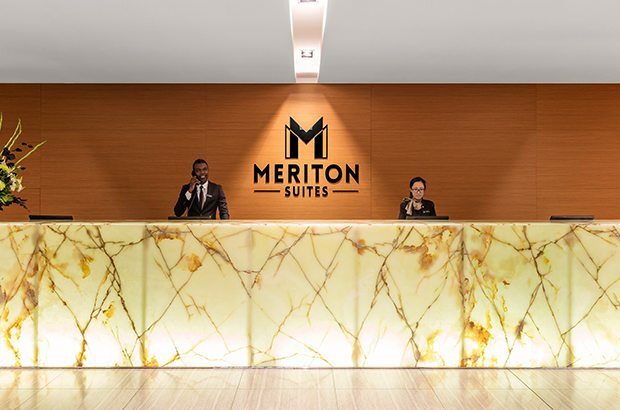 Majority of Meriton Suites hotels are officially rated 5 stars by Star Ratings Australia, and part of the Australian Tourism Accreditation Program by Quality Tourism Australia. All of our 27 Penthouse Collection Suites are rated 5 stars. Star ratings are used in more than 70 countries worldwide and reflect the cleanliness, quality and condition of guests facilities. Keep connected with complimentary high-Speed Wi-Fi in all areas of our hotels including your suite. We know how frustrating internet caps can be that’s why at all Meriton Suites locations, Wi-Fi is unlimited and uncapped. Continue to connect with friends, check emails and surf the web with our complimentary high-speed Wi-Fi, accessible from all suites and hotel shared areas. 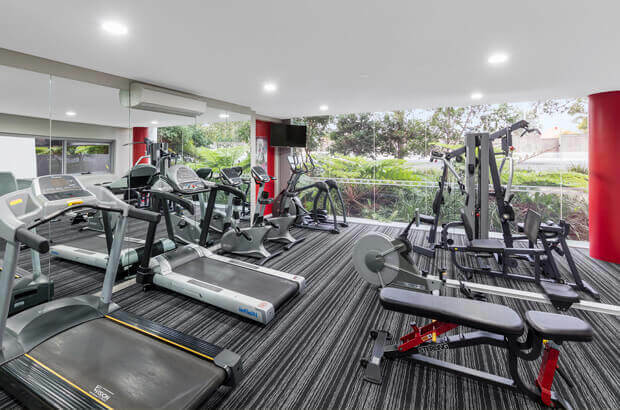 Sometimes, a more energetic break is required, and for those guests who need a workout or who simply want to maintain their current fitness regime while travelling, our fitness centres are a perfect option. Equipped with cardio equipment and weight machines, fitness centres are available at all of our locations. 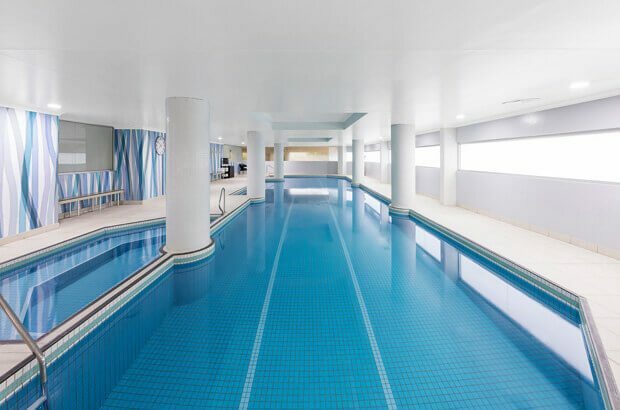 Don’t forget to pack your swimmers, as each one of our properties has an indoor heated swimming pool, spa and sauna. 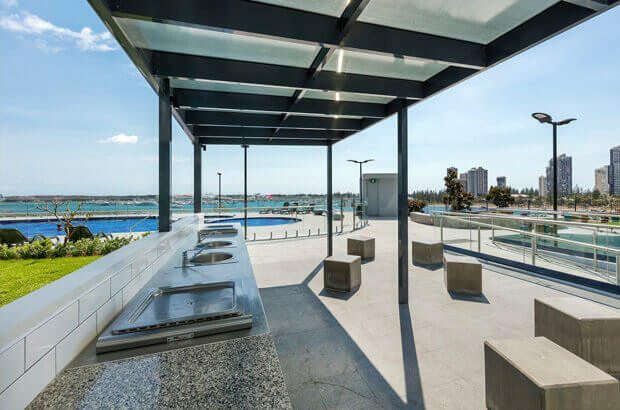 Our two Gold Coast as well as our Church Street, Parramatta properties also feature an additional outdoor pool and sun deck. Each property maximises the available space and we have added additional recreational facilities at some locations. Many of our properties have BBQ facilities that can be used by all guests. 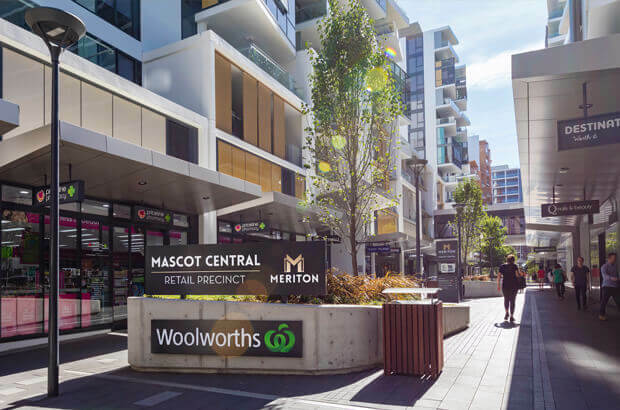 By choosing Meriton Suites in Sydney, Brisbane or Gold Coast you can be guaranteed that our hotels are centrally located amongst transport, shopping, sightseeing, beaches, restaurants and supermarkets.